The UFC and its top star Conor McGregor have come to terms on a new deal that will see the Irish star locked down for six more fights. The news of McGregor’s new deal with the organization was reported by ESPN’s Darren Rovell for six fights. McGregor’s recently launched Proper No. 12 brand of whiskey will be a sponsor for all of McGregor’s forthcoming fights and featured on the canvas when he fights. The 30-year old McGregor entered the UFC in April 2013 fighting on the Facebook preliminary card and risen to become the top star in the sport and one of the biggest sports celebrities worldwide. His drawing power soared last year when he fought Floyd Mayweather Jr. at the T-Mobile Arena in Las Vegas in front of 13,094 paying $55,414,865.79. The fight generated the second highest number of pay-per-view buys in combat sports history with 4.3 million purchases. 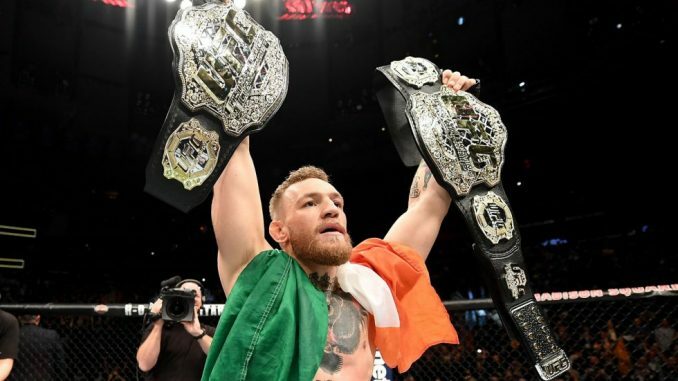 McGregor owns several UFC records, including pay-per-view buys with 1.6 million for his August 2016 rematch with Nate Diaz and the highest UFC gate in history with $17,700,000 for the UFC’s debut at Madison Square Garden when he fought Eddie Alvarez in November 2016. McGregor holds four of the top five live gates in the history of mixed martial arts within the state of Nevada for his fights with Jose Aldo ($10,006,249), his first fight with Nate Diaz ($8,197,628), his rematch with Diaz ($7,700,810.60), and with Chad Mendes ($7,201,648). McGregor became the undisputed featherweight champion in December 2015, defeating longtime champion Jose Aldo in 13 seconds at UFC 194. He became a two-division champion in November 2016 stopping lightweight champion Eddie Alvarez. McGregor will have his first mixed martial arts fight in almost two years when he challenges UFC lightweight champion Khabib Nurmagomedov on Saturday, October 6th at UFC 229 in Las Vegas at the T-Mobile Arena.